Some folks say “Chicken Brained” as if it were an insult. I happen to think chickens have quick albeit small minds with a remarkable ability to recall people, facts and sounds. Please don’t take me to be one of “those” animal people who go off the deep-end on such subjects. No, I think I keep a pretty level head HOWEVER through the many years I’ve had to non-scientifically observe those fowl closest to me I’ve come to a few conclusions of my own. Number One~ Chickens know and recognize people and voices. 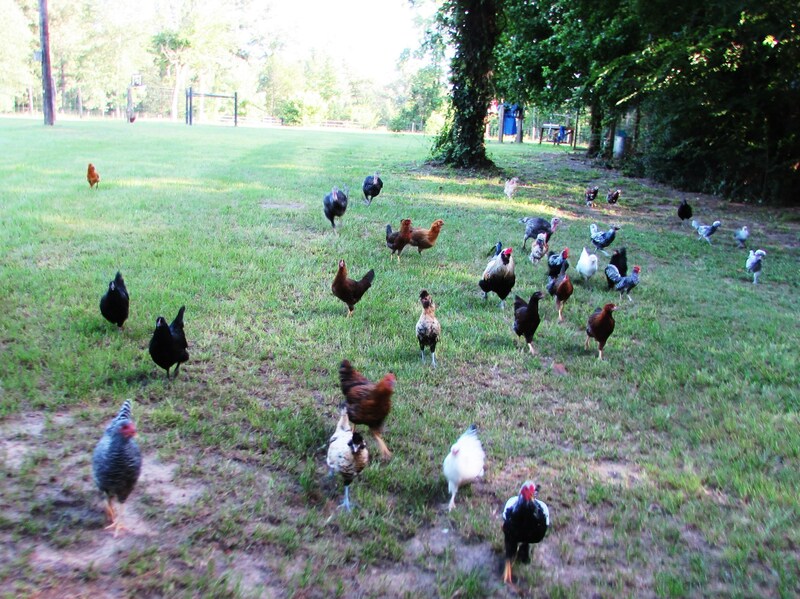 When I get home in the evening, as soon as my feet touch the ground the flock comes running. I have only to glance over my left shoulder to be practically blinded by a running, clucking, wild mish-mash of feathers, muffs, fruff-ties, beards, beady eyes and cute clawed feet. I asked my husband awhile back if he were ever greeted in such a manner, he laughed and said “No honey, they only do that when you get home”. This made me feel really good even though I know it is probably just because the first thing I do every day when I get home is throw them treats. Still, they KNOW who I am. I am the Treat Lady. Likewise when I call them in my shrill east-Texas drawl “Hereeeeeee Chick, Chick, Chick!” They mob me. Literally come running from north, south, east and west like Jesus was coming back. When Addie calls them, they glance up and unless treats are visible and obtainable, they ain’t movin’. Number Two~ Rooster knows best. And the Rooster learns by experience. 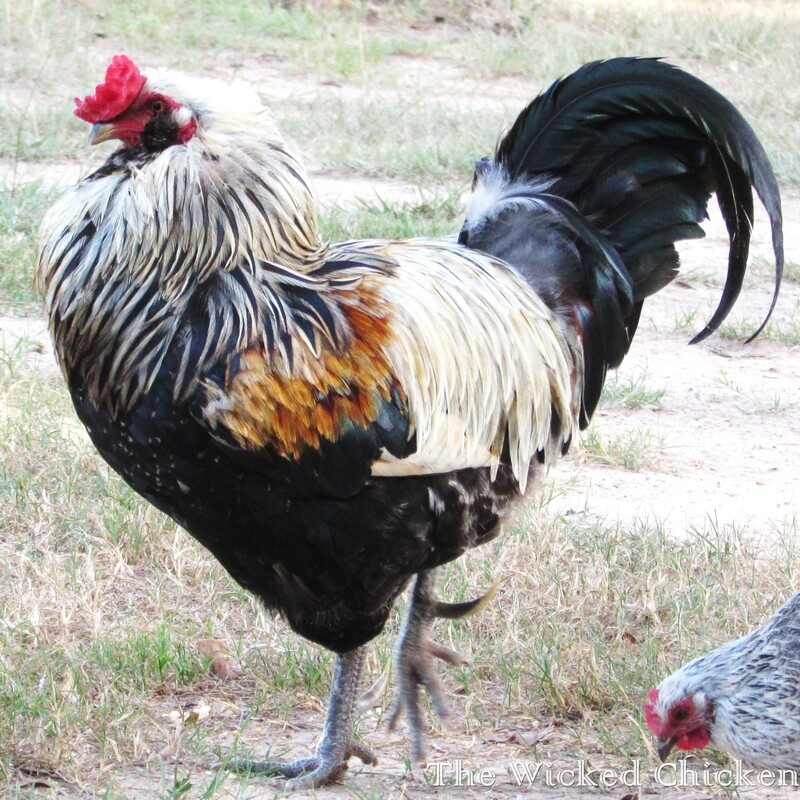 Randy, my rooster, is now 3 years old and 1 of 3 chickens left from the original flock. That first batch got chased, eaten, tracked and hunted in spite of my best efforts to keep them safe. The second group ended in much the same way. This group is different. Randy has learned thru trial and error the dangers of living and how to stay alive. A hawk cries in the distance, a strange animal appears, an un-known human gets to close, anything that goes on that could endanger the flock, he stands straight up and gives a quick, loud warning noise that is obeyed immediately by all chickens in hearing range. They leave whatever bath they were taking, treat they were eating, bug they were stalking and head right for the nearest cover, speedy quick! 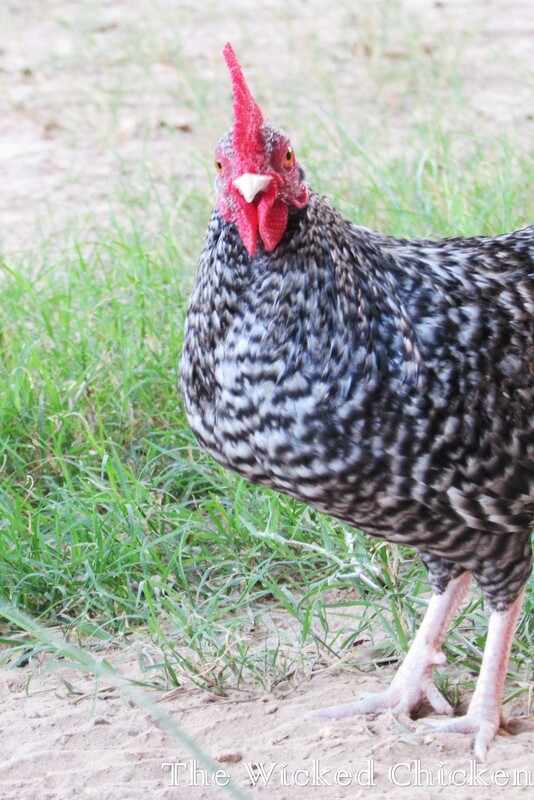 Sometimes this is the coop, sometimes the thicket and other times underneath the horse trailer or car. Whatever is closest. They know, they hear, they obey. Unlike their unfortunate predecessors. Randy has some impressive spurs. Number Three~ They form clicks. Chickens, hens in particular, are worse than any teenage girl ever thought about being! Unless you are the right age, the right breed and the right color…..well. You can forget about being included in certain activities. The first time I observed this I thought I was crazy but after seeing it time and time again as well as talking to other poultry owners who observed the same thing, well. Chickens are just downright clannish. My Black Australorps all hang together, the 2 Brown Ameraucana hens stick tight while the White Ameraucana is almost always alone while the 2 older, Gold Ameraucanas are inseparable. The Brabanters are forever photo-bombing one another. The Salmon Faverolles love each other but tend to shun the one who was hurt as a chick and has only 3/4 of one wing, she is different and they know it. The Lavender Polishes have slept side-by-side every night since I brought them home as chicks, getting very grumpy if someone tries to squeeze in-between. They have enough brain power to recognize each other even though they have never glanced in a mirror or poured over a breed book. They just simply know. Which is why I try to always keep at least 2 of the same type at once, otherwise they are left alone with no friends. The roosters don’t seen to suffer from this as much, they are much to busy trying to ‘love’ everyone to worry about discrimination. Number Four~ Okay. So I am out of examples of chicken brilliance. In conclusion I just want the world to know, to have a bird brain isn’t a good thing to hurl as an insult. Quite the opposite, some people I’ve met would do well to have a bird brain. Because to be able to recognize those humans who truly care for you, to know and listen to the right voices, to heed danger and pay attention to those older and wiser than yourself and to be able to identify those around you with clarity……heck. I think we could all use a little more of a ‘bird brain’. I have two cross breed banty roos who have been together all their lives. All day long they wander around the garden, side by side, until one wanders around the corner of the house without the other following: panicking screech; running, bodies close to the ground and tails flat for streamlining; then they see each other; happy clucking; shuffle shuffle; and then they fight. Whenever they want snacks (they love budgie seed) they sneak into the house, poop on the floor and start throwing the dog’s food out of the bowl. And don’t even think about walking in the garden. Unless you are sitting on a chair you will be attacked. Throwing their tennisball used to work as a distraction, but nowadays they walk three steps, turn around and then…well you’d better run. I’ve also noticed that they like human company, when you are safely seated they stay in the same part of the garden and scratch and preen to show off. And lastly, every night they come inside and perch on their favourite chair, looking in opposite directions to make sure nothing sneaks up on them from behind.